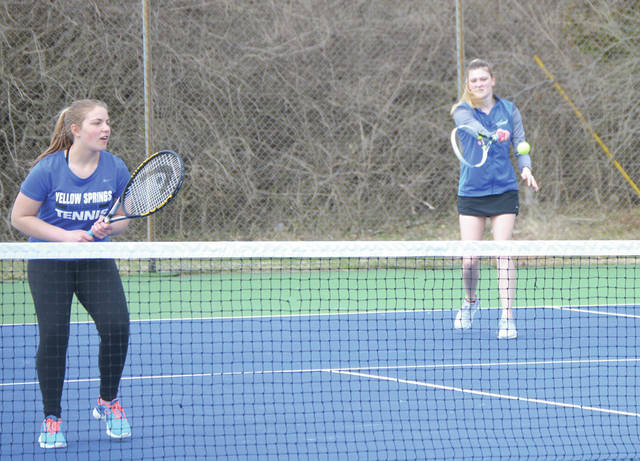 The Yellow Springs female tandem of Olivia Snoddy (left) and Tyler Linkhart defeated LCA’s female duo of Abby Day and Halacie Oliver in straight sets in a boys high school first doubles match, April 4 in Xenia. With Bulldogs coach Stacey Knemeyer looking on from the fence, Yellow Springs No. 2 singles player Ian Sherk returns a baseline shot, April 4 on his way to a straight set win over Legacy’s Jon Day. 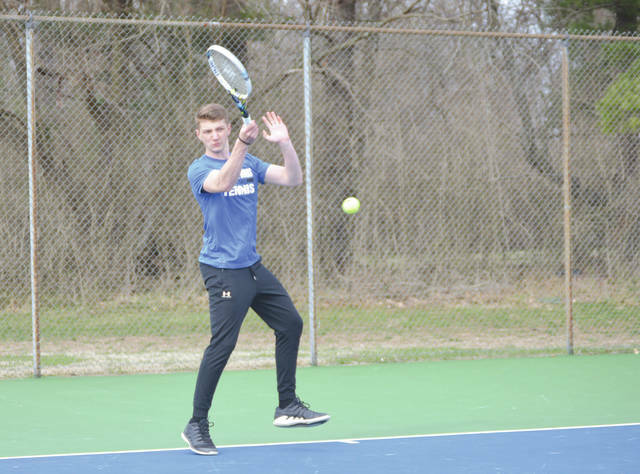 In one of the day’s tighter matches, Yellow Springs’ David Walker rallied with a a tiebreak win in the second set and a 10-2 pro set in the third to defeat Legacy Christian’s Sammie Lomelin at third singles, April 4 in Xenia. 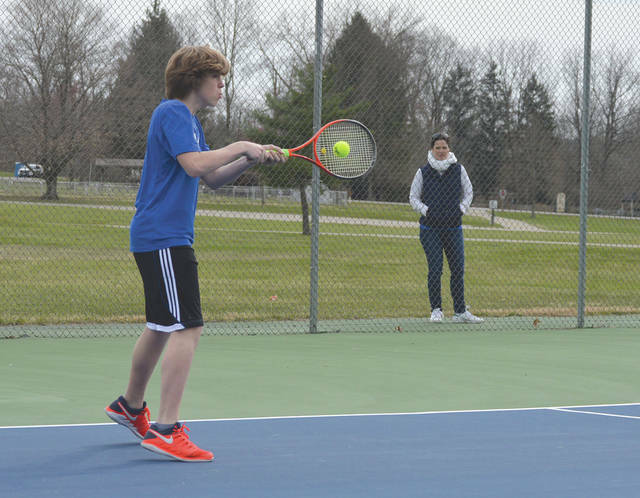 The Yellow Springs doubles pair of Abby McAnerny and Biron Schoonover (forecourt, left and right) rallied past Legacy Christian’s Maddie Combs and Mathias Ewing in three sets at second doubles, April 4 on the Fairground tennis courts in Xenia. 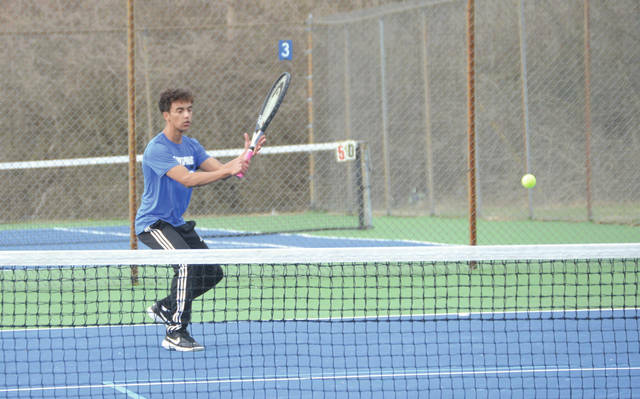 XENIA — Visiting Yellow Springs defeated Metro Buckeye Conference host Legacy Christian five sets to none on a cool, blustery April 4 at the Fairgrounds tennis courts, but the Bulldogs needed to go three sets in two of those matches to earn the boys high school team tennis win. Bulldog singles players Forrest Rowe and Ian Sherk won quickly at first and second singles respectively. Rowe defeated Legacy’s Will Hess 6-0, 6-0, while Sherk swept the Knights’ Jon Day 6-1, 6-0. In a very evenly played match, Yellow Springs’ David Walker lost his opening set 4-6 to Legacy’s Sammie Lomelin. He then claimed a 7-6 (5) tiebreak win to take the second set. Then, since the team outcome had already been determined before they could play their final set, the two played a super-set tiebreaker to determine the third singles outcome. Walker claimed the win with a 10-2 third-set victory. The Bulldogs had already clinched the team win before Walker and Lomelin could finish. That’s because the Yellow Springs duo of Oliva Snoddy and Tyler Linkhart quickly claimed a 6-0, 6-0 win over LCA’s Abby Day and Halacie Oliver in an all-girl battle at No. 1 doubles. The other three-set tussle was perhaps the closest of the evening. 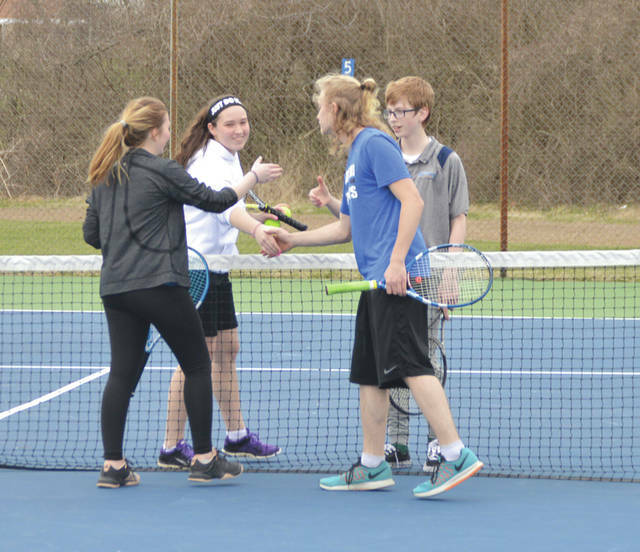 Bulldogs Biron Schoonover and Abby McAnerny won a close 5-7, 6-2, 10-8 second doubles match over the Knights pair of Maddie Combs and Mathias Ewing. The Metro Buckeye Conference website lists Yellow Springs’ next match as being a Friday, March 12 match at MBC foe Dayton Christian, but Knemeyer said her Bulldogs are scheduled to host Valley View on Monday, March 8 before then. In the losing effort, Knights coach Les Rose was happy with how his team played. Legacy is back in action at 4:30 p.m. on Monday, April 8 when the Knights pay a visit to Centerville for a nonleague match.